Sergius (Stragorodsky) of Moscow was the seventeenth Patriarch of Moscow and All Russia. He previously served as a bishop in three dioceses and as deputy and patriarchal locum tenens from 1927 to 1943, having ascended to this position following the death of Patr. Tikhon and imprisonment of Metr. Peter of Krutitsy, the previous locum tenens. He was particularly known and criticized for his allegedly willing submission to the Soviet government in Russia, often referred to as Sergianism. Ivan Nikolayevich Stragorodsky was born in the town of Arzamas near Nizhny Novgorod on January 11, 1867. His father, Nicholas, was an archpriest. After receiving the name Sergius when he was tonsured a monk, he studied in the Nizhny Novgorod seminary, followed by studies at the St. Petersburg Theological Academy. Sergius became proficient in Greek, Latin, and Hebrew. He was ordained to the diaconate and then to the priesthood. He was soon raised to the rank of archimandrite. In September 1890, he arrived in Japan to assist Bp. Nicholas of Japan. Here, while he taught at the Tokyo Orthodox Seminary, he became fluent in Japanese before his return to Russia in 1898. Upon his return to the St. Petersburg Academy in 1899, he was appointed rector. In 1901, Sergius was appointed Archbishop of Finland and Vyborg. In 1911, he became a member of the Holy Synod of the Church of Russia. 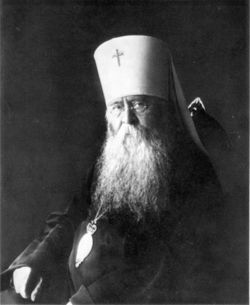 He was transferred to the diocese of Vladimir and Shuya on August 10, 1917. Subsequently, he was raised to the office of metropolitan on November 28, 1917 by Patr. Tikhon. With the Bolsheviks now ruling Russia, Sergius was arrested in January 1921 and spent several months in jail before being exiled to to Nizhny Novgorod. Between June 16, 1922 and August 27, 1923, Sergius became involved in the Renovationist schism, the so-called Living Church, but repented his actions publicly and was forgiven by Patr. Tikhon. 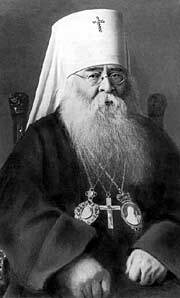 The Patriarch appointed him Metropolitan of Nizhny Novgorod on March 18, 1924. Sergius as Metropolitan of Nizhny Novgorod. Metr. Sergius himself was in prison from November 30, 1926 to March 27, 1927. After his release Sergius strived for some way of obtaining a peaceful reconciliation with the Bolsheviks so as to stop the terror and persecution against the Church. In his most (in)famous attempt, Sergius issued a Declaration on July 20, 1927 in which he pledged absolute loyalty of the Church of Russia to the Bolshevik regime. This declaration caused an immediate controversy among the Russian clergy and laity, many of whom broke communion with him, both internally in Russia as well as abroad. This controversy has continued even after the fall of the Bolshevik government. However, through his declaration he was able to establish a Temporary Patriarchal Council that received government recognition. In 1934, he assumed the title of His Beatitude, Metropolitan of Moscow and Kolomna. In 1936, on the basis of reports of Metr. Peter's death, although in reality he wasn't executed until 1937, Metr. Sergius assumed the title of Patriarchal Locum Tenens. But arrests and executions of the Orthodox clergy and destruction of cathedrals, churches and other Church property continued. By mid-1941, only four bishops remained free in the territory of the USSR. With the serious strain on the USSR caused by the Nazi invasion in 1941, Joseph Stalin began scaling down on the campaign of militant atheism advocated by the Bolsheviks and sought the moral and financial support of the Church of Russia in the war. Stalin, on September 4, 1943, met with the hierarchy of the Church and, in exchange for their loyalty and assistance, gave concessions to religion. Among these concessions were permission to open the Moscow Theological Academy and Seminary, release of imprisoned clergy, and return of church property including the Holy Trinity-St. Sergius Lavra. This was at the cost of increased control by government secret services. Among the concessions was an important one: permission to convene a council to elect a new patriarch. At a formal meeting of bishops on September 8, 1943, Metr. Sergius was elected to the see of the Patriarch of Moscow. Although of advanced age (he was 76) and ailing in health, he was enthroned on September 12, 1943. He died eight months later on May 15, 1944 in Moscow. Tragedy of Russian Church. 1917-1953. Lev Regelson. Afterword by John Meyendorff. This page was last edited on March 6, 2014, at 13:59. This page has been accessed 31,240 times.